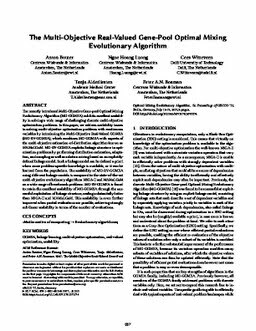 The recently introduced Multi-Objective Gene-pool Optimal Mixing Evolutionary Algorithm (MO-GOMEA) exhibits excellent scalability in solving a wide range of challenging discrete multi-objective optimization problems. In this paper, we address scalability issues in solving multi-objective optimization problems with continuous variables by introducing the Multi-Objective Real-Valued GOMEA (MO-RV-GOMEA), which combines MO-GOMEA with aspects of the multi-objective estimation-of-distribution algorithm known as MAMaLGaM. MO-RV-GOMEA exploits linkage structure in optimization problems by performing distribution estimation, adaptation, and sampling as well as solution mixing based on an explicitly-defined linkage model. Such a linkage model can be defined a priori when some problem-specific knowledge is available, or it can be learned from the population. The scalability of MO-RV-GOMEA using different linkage models is compared to the state-of-the-art multi-objective evolutionary algorithms NSGA-II and MAMaLGaM on a wide range of benchmark problems. MO-RV-GOMEA is found to retain the excellent scalability of MO-GOMEA through the successful exploitation of linkage structure, scaling substantially better than NSGA-II and MAMaLGaM. This scalability is even further improved when partial evaluations are possible, achieving strongly sub-linear scalability in terms of the number of evaluations.